Alhamdulillah it is the end of Ramadhan. I’m quite sad and I really hope I will meet Ramadhan again next year. Ramadhan is something that I have been waiting every year. It is more than just a Islamic holy month. This year Hari Raya (Eid al-Fitr), I will be going back to Johor Bharu for two weeks holiday. It’s been awhile since I went back my hometown in Johor Bharu. As usual, on the first day of Hari Raya, I will be going back to Singapore (my mother family side) and on the second day of Hari Raya, I will be going back to Rengit Johor (my dad family side). 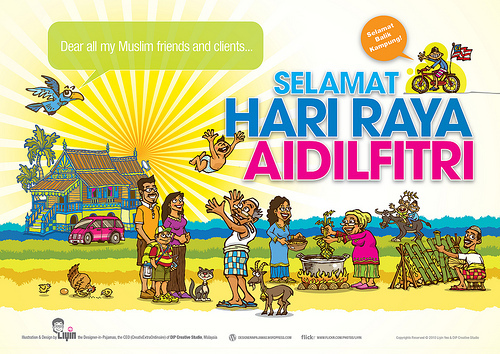 I would like to take this opportunity to wish my Muslim friends and clients “Selamat Hari Raya Maaf Zahir Batin”. As human myself, I will never run from making a mistake. From bottom of my heart, I’m sincerely want to apologise if I did any mistake or did not deliver my work up to your expectation and if the mistake that I did require me to meet you for a discussion, do let me know. Last but not least, I would like to wish Happy holiday to my non muslim friend. P/S: I will slightly less update my blog due to spending some quality time with my family. Eid al-Fitr marks the end of the Islamic holy month of Ramadan. Muslims across the globe celebrate – Eid al-Fitr festival by attending communal prayers, listening to a khutba (sermon) and giving zakat al-fitr (charity). The popular Muslim holiday is determined by the sighting of the new moon. On Eid, you can greet your Muslims friends by wishing them “Eid Mubarak!” (meaning have a Blessed Eid), another way of greeting is by saying, “Eid Saeed!” (meaning Happy Eid!). You can also say “Kul ‘am wa enta bi-khair!” (May every year find you in good health!) or “Taqabbala Allahu minna wa minkum” (May Allah accept from us, and from you) to convey your Eid greetings to a friend. 1. “You will not attain righteousness till you spend in charity of the things you love.” [The Qur’an, Chapter 3, verse 92] Happy Eid! 2. “Do good deeds properly, sincerely and moderately and know that your deeds will not make you enter Paradise, and that the most beloved deed to Allah’s is the most regular and constant even though it were little.” [Prophet Muhammad (s) as narrated by A’isha (ra) in Sahih Bukhari, vol. 8, hadith 471] Eid Mubarak!! 4. “God is kind and likes kindness in all things.” [Rihadh us-Saleheen, Volume 1:633] Happy Eid! 7. “And whosoever puts his trust in Allaah, then He will suffice him” [al-Talaaq 65:3] Eid Saeed! !